Some glorious opportunities for those with patience. First, European equities. There are potential opportunities here for the brave in the Polish stock index (only European nation to avoid recession in the last 5 years, p/e 7.7, dividend 4.9) or Russia (oil price dependent, but if oil holds up, p/e 5.3 cheapest on the continent), but if we play it safe, then Germany remains an economic powerhouse, but has been held back by PIIGS worries. Germany’s p/e is at 11 currently, back at the levels where the last secular bull market began. German equity yields are currently 3.6, having reached even higher toward the end of 2011, giving us readings that have also marked great long term buying opportunities. The UK FTSE has a p/e of 9.8, into the single digit p/es that have historically marked secular bottoms, and is paying dividend yield of 3.7 – another attractive combination. 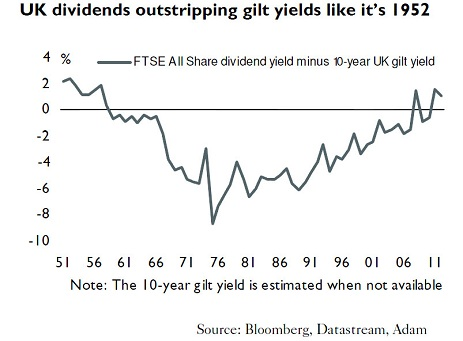 If we look back at the history of equity dividends versus gilts yields, then UK shares are relative to UK government bonds as attractive as they were at the start of the 1950s, which was when the 1950s secular stocks bull market really got going. 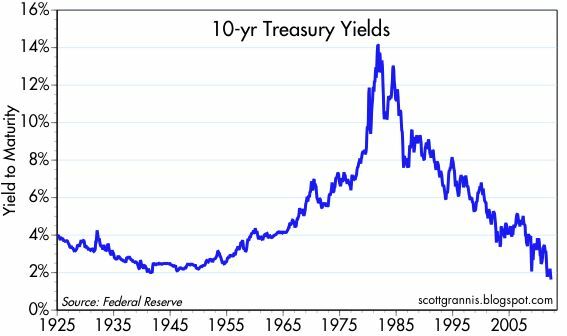 The US stock market dividend yield also makes US equities very attractive to treasury yields, historically. Plus, treasury yields are at all time record lows, paying negative real returns. Treasury yields have historically made long term waves lasting around 30 years alternating up and down. 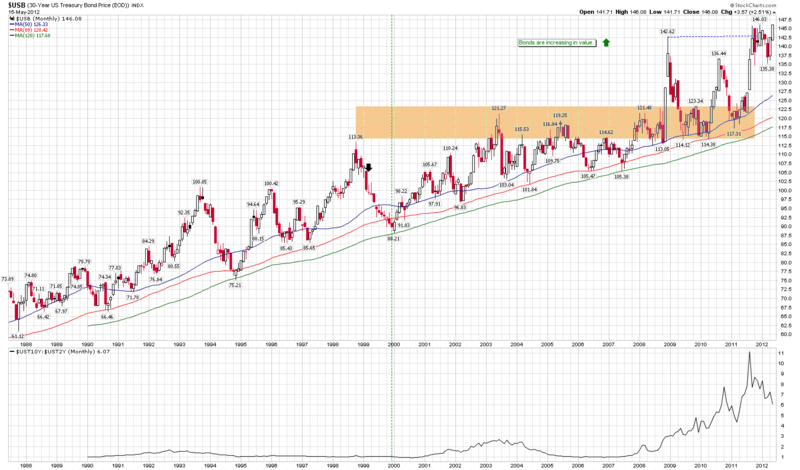 The current down wave in yields is due to come to an end, giving rise to a long bear market in treasury bonds. This should occur as money flows back into equities and real estate in new secular bull markets, and as China gradually withdraws from its excessive treasury purchase programme. The global real estate bust since around 2007 has largely completed its course, with house prices historically tending to rise around 12 years and fall around 4 years. 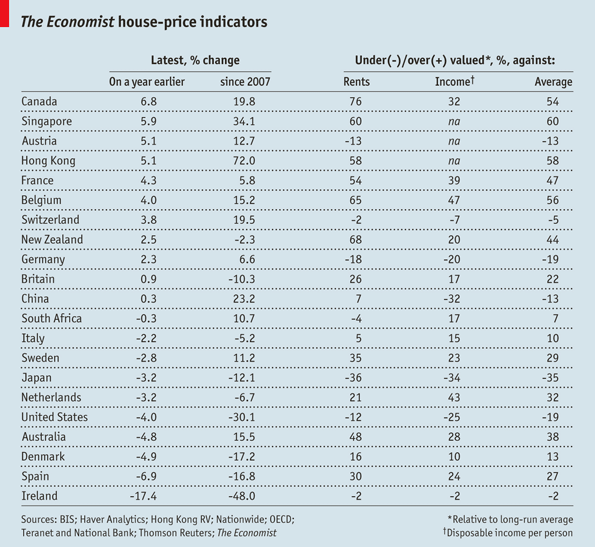 The table below reveals that US and Ireland, which both had major housing bulls, are now undervalued. 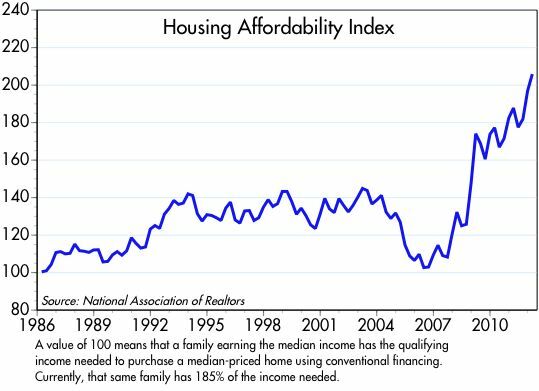 Affordibility for US housing has never been better. Coupled with the significant undervaluation shown above, US real estate looks a great longer term buy here. UK real estate is still somewhat overvalued, but topped out about a year after the US, so perhaps needs a little more time to bottom out. Japan stands out in the above table as the most undervalued, and in fact, Japanese real estate gradually lost around 70% of its value since deflation took hold 2 decades ago. An opportunity for the brave, but one that should again pay off handsomely in the longer term. To sum up, there are some great buy and hold opportunities for the longer term – high reward, low labour trades. 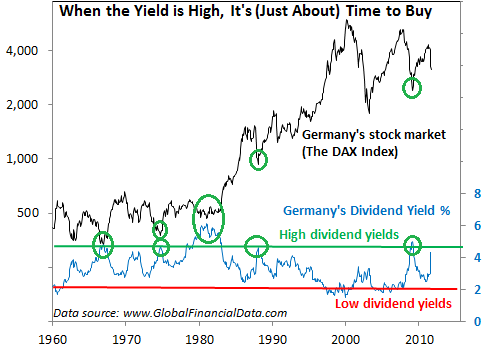 The Dax and FTSE valuations and dividends versus bonds echo what I suggested in my secular position analysis that we should be looking upwards not downwards for stocks. The record extremes in treasuries, bond yields versus stocks yields and real negative returns equally reflect that we should be looking short government bonds not long. And finally, real estate in some countries, particularly in the US, now looks historically a buy again. Drawing all together I believe the future it clear – that we will see money flowing out of government bonds and into equities and real estate. For now though, echoing Scott Grannis’s thoughts, the markets are pricing in a Lehman style event in Europe, and hence the extremes. Anything not as bad as that is likely to encourage money flows the other way. 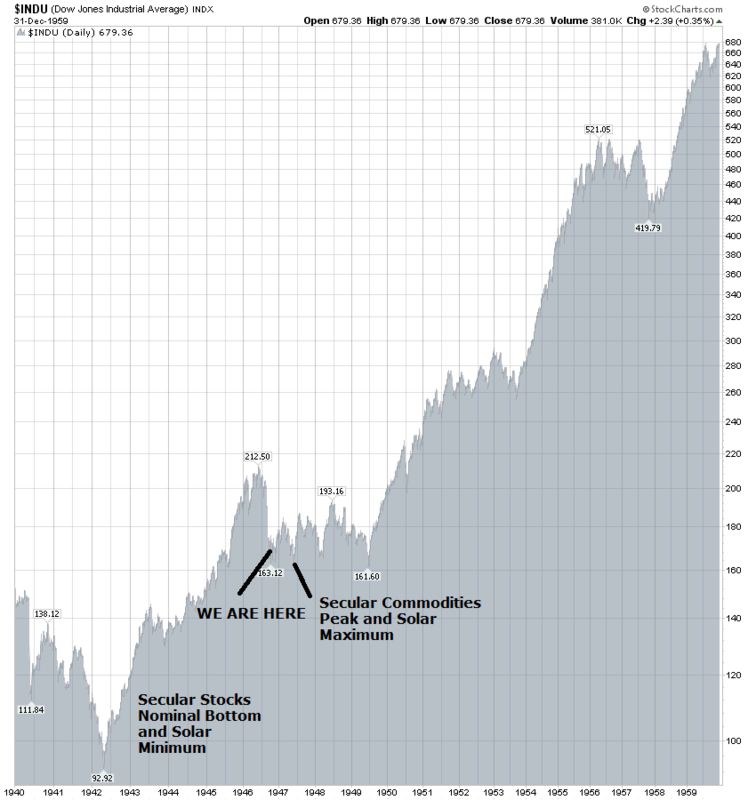 That’s in a similar vein to my secular positioning historical analysis, namely that around this point in previous secular stocks bears, things also looked a mess and fear reigned, and yet equities barely made new nominal lows after that. As Russell Napier says, there comes a point whereby equities are so historically cheap that just slightly less bad news will propel them higher. With the German Dax back at its last secular lows in valuation, that makes it, to me, a compelling buy. We can assess the odds of a bear market and recession ahead (with the former leading the latter), by amalgamating mutliple indicators. If you followed me on Amalgamator then you may recognise this as an exercise I’ve done before. I will mark in green those indicating no bear/recession ahead, red those that do, and leave black those in neutral territory. 1. Ten year treasury yields (over 6% is a historical marker of the end of cyclical stocks bulls) – currently less than 2%. 2. 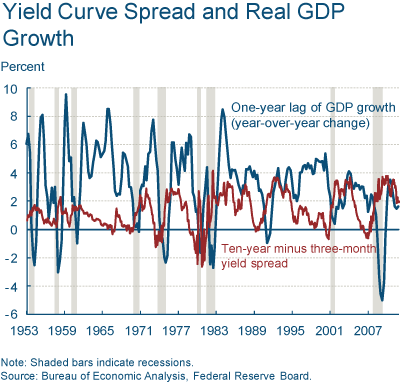 Yield curve / spread (if abnormal or inverted, may signal bear/recession ahead) – currently flattening but normal. 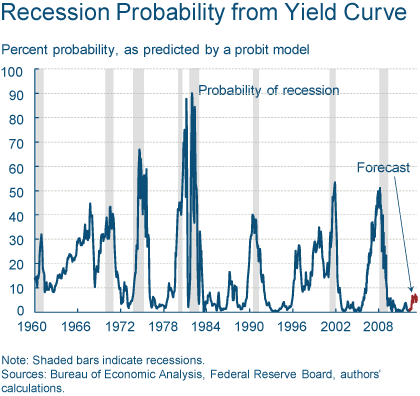 Yield curve suggest negligible probability of recession. 3. Inflation rate (over 4% is a historical marker of the end of cyclical stocks bulls) – currently 2% official in the US but 5.5% by Shadowstats, so taking something inbetween as the reality, let’s mark that neutral. In Europe, official rates generally are between 2-3% and China 3.5%. Overall neutral. 4. Interest rate (overtightening of interest rates is a historical market of the end of cyclical stocks bulls and imminent recessions) – currently ZIRP in the US and negligible in the major economies. 5. Money supply and Velocity of money (both rising and positive for the most positive outlook) – in the US money supply is still in a rising trend but velocity is still falling; in the Eurozone the situation is the same; between them neutral. 6. Solar Cycles (predict secular asset peaks, growth/recessions and inflation) – one year from the solar peak we should see growthflation and pro-risk speculation as sunspots rise. 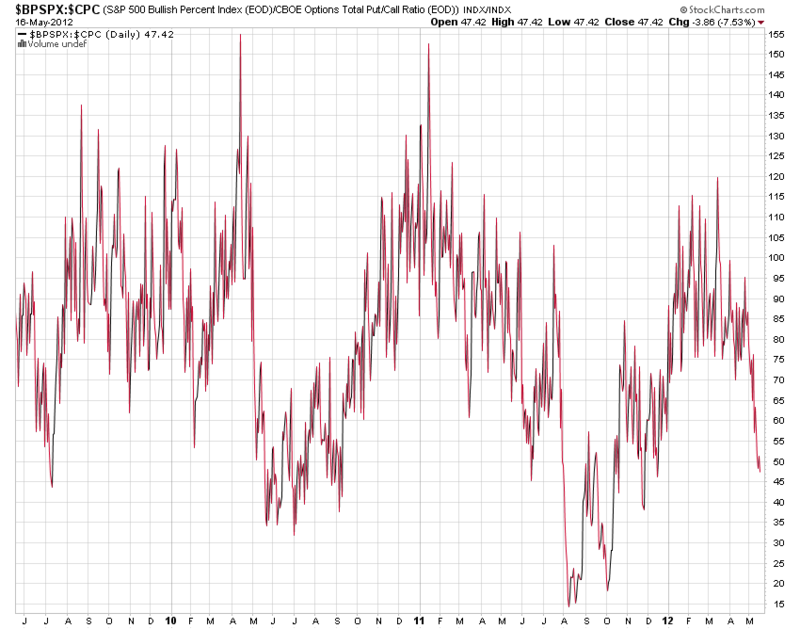 A bear and recession here would be a historic anomaly. 7. Leading Economic Indicator composites of Conference Board, OECD and ECRI (trending positive or negative?) – Conference Board global LIs are mixed but weakening, OECD overall positive, ECRI for US neutral and close to zero. Overall neutral. 8. Manufacturing (this is a lead indicator, whereas GDP, income, employment and CPI are coincident or laggard) – US is weakening but still positive, Eurozone has turned negative, China still strong above 10%. Overall neutral. 9. Dr. Copper (copper is a bell weather for the economy and markets) – in recent weeks copper has drooped and looks technically weak. 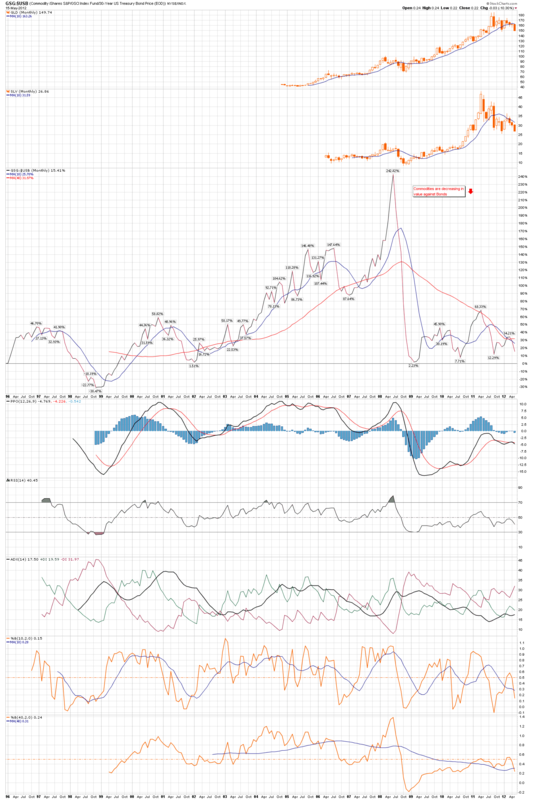 Although the longer term trend is still in tact from around the start of the secular bull market in 2000, the near term prognosis from this Doctor is negative. 10. Dr. Kospi (the Kospi index is also a bellweather) – the Kospi has rallied the last couple of weeks but so far only a partial retrace of deeper falls. The 12-monthly picture is sideways. Overall a negative. 11. 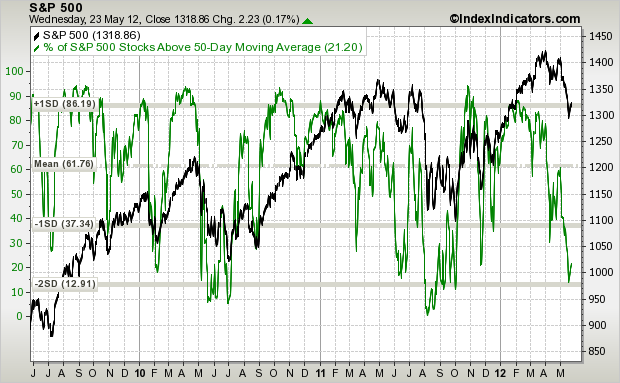 Stock Market Breadth (usually deteriorates and diverges from price into a stock market top). 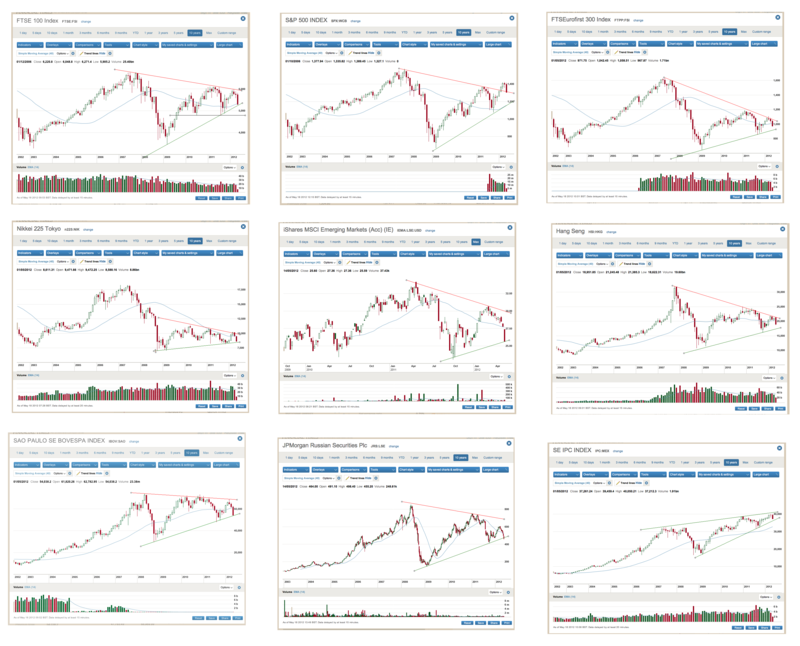 At the March 2012 top-to-date, we did not see the typical negative divergence in breadth that accompanies a major top, plus cyclical sectors displayed relative strength, unlike ahead of other previous major tops whereby they weakend some weeks or months ahead of the top. 12. Economic Surprises Index (is a lead indicator and also a mean reverting indicator – is it at a historic extreme, is it leading counter trend?) – Economic Surprises have typically oscillated between +50 and -50, and currently Surprises for the major economies are at -31, for the US alone -30. In the last couple of weeks they have attempted to flatten out somewhat, but until an upward trend develops, this is a negative. 13. Earnings (solid beat rates in both earnings and revenues, and future guidance) – in this last US earnings season quarter, the overall earnings beat rate came in around 62%, which is weaker than the historical average but better than achieved throughout 2011, whilst the spread between companies raising rather than lowering guidance was positive. 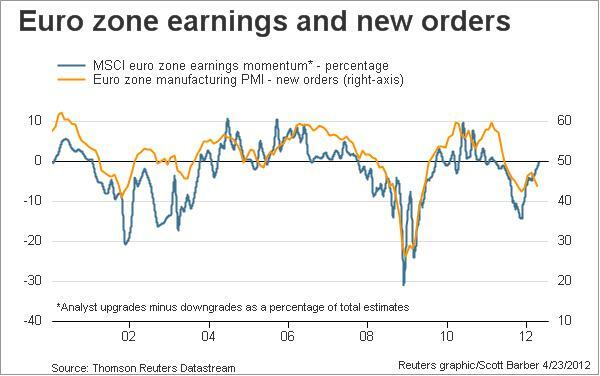 Eurozone earnings upgrades versus downgrades are at neutral. Overall neutral. 14. Seasonality (monthly seasonality, 4 year presidential cycle) – May to July has historically been positive, a period of lower seasonal geomagnetism. Specifically though in a US election year, a major bottom has been carved out in May-June, from which the market then rallied into the (November) election. That makes it a positive from here. 15. Bull Market Historic Internals and Historical rhymes (compare and overlay with historical precedents) – in my recent post ‘The Secular Position’ I showed that in the last 2 secular stocks bears / secular commodities bulls there were clear parallels to the current one, and that in the 1970s and 1940s our current position showed that we should be looking upwards for stocks, not downwards, in the bigger picture. Here is one more, showing the 1910s secular stocks bear / secular commodities bull – a similar picture, with some upside ahead in the next 12 months, and then some downside as the post-solar peak, post-commodity peak recession occurs. 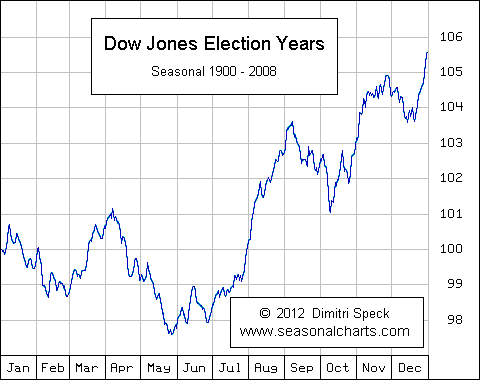 All 3 historic parallels show a positive picture for equities and commodities for the next 12 months. 16. Oil Price (the stock market was historically killed by a doubling of the oil price in a 12 month period) – the oil price has dropped by 10% in the last 12 months as measured at today’s price – that is a positive. 17. Real GDP growth YoY (dropping beneath 2% has invariably led to a recession) – currently just above 2% in the US, delicately poised. As the latest data marked a push up, this is neutral for now, but will be resolved one way or the other in the months ahead. 18. Stocks and commodities relative cheapness to bonds (compared to history) – currently stocks are in the historic neutral range in pricing versus bonds, whilst commodities are at extreme cheapness versus bonds. That’s overall postive for pro-risk. 19. Bond yields versus stock yields (long term government bonds yields should not exceed stocks yields by more than 6%). 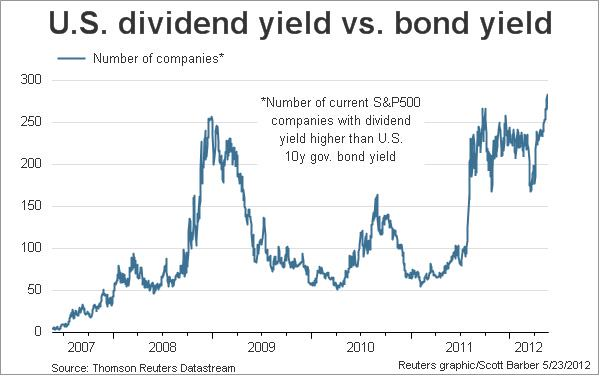 This has in fact inverted, with bond yields paying negative real returns. 20. 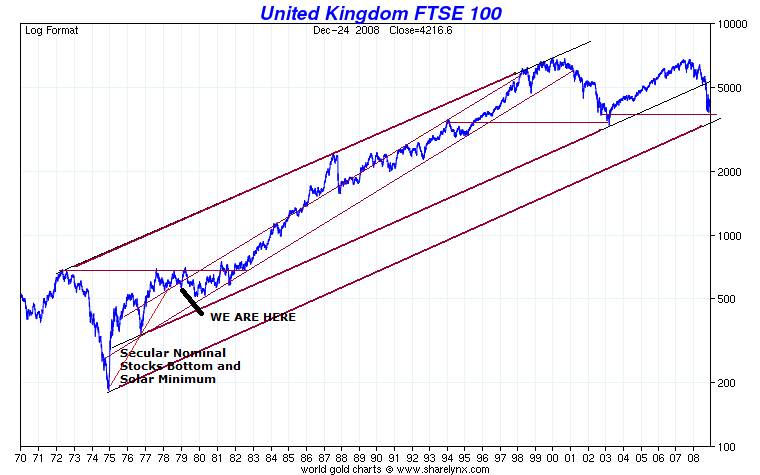 Stock valuations (stocks p/es should be historically reasonable (historic US average 17)) – US currently 14, Germany 11, UK just under 10, China 7 – all historically reasonable. 21. Investor sentiment (II, AAII, Market Vane, etc, sentiment survey readings should not be overly bullish). 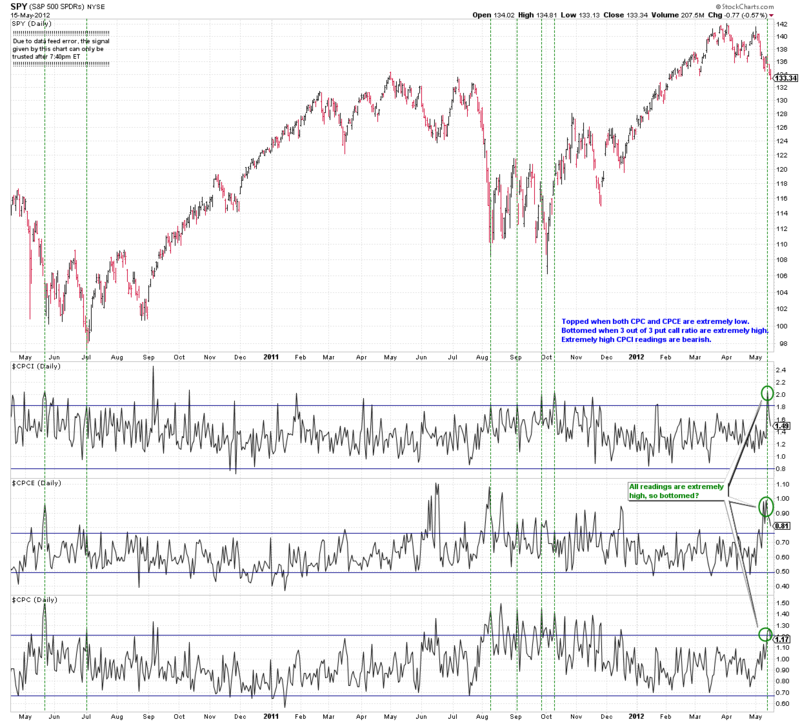 AAII is at high bearish, which is contrarian bullish, whilst II is neutral to bearish. Overall positive for equities. Overall, roughly half of the indicators are positive and do not support a bear and recession ahead. The remainder are mostly neutral with just three true negatives currently. Those kind of odds I will take. To sum it up, the evironment is positive for pro-risk in terms of negligible interest rates, bonds pricing and dividends (compared to commodities and stocks respectively), and central bank supportive intervention. However, the weakening of leading indicators and economic surprises and the esclation of Euro debt has driven money again to safe havens, pending a natural improvement or central bank assitance. Should neither occur/work, then we would likely see a deterioration in the above picture and a greater likelihood of bear and recession ahead. This, however, would be anomalous to historic analogues, Presidential and solar cycles. Regardless, due to oversold/overbearish extremes in pro-risk (Euro, stocks, commodities), a period of mean reversion should come to pass. As we rally again upwards, we should print the divergences that were missing in March, if this is to be a major top. If we are not topping out here, then that mean reversion rally should be healthy in internals and accompanied by an upturn in leading indicators and surprises. 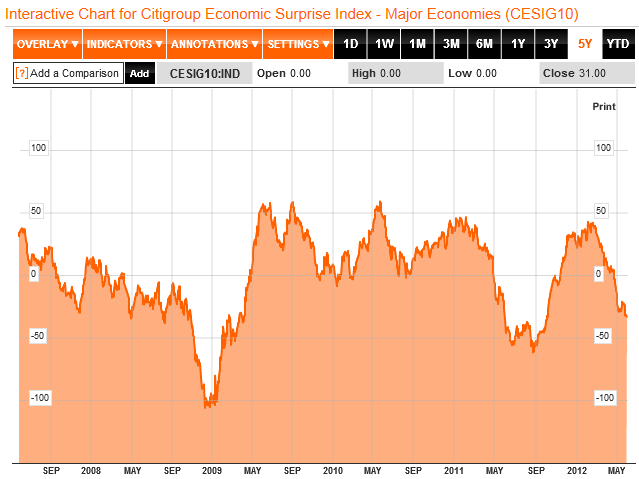 Global economic surprises remain flat to down. 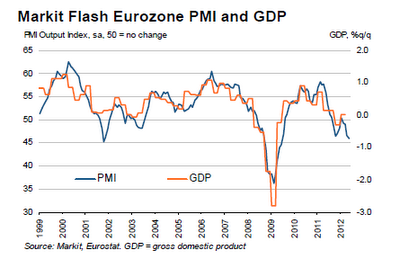 Leading indicators for Euro-land fell to minus 0.8. Globally, some countries have slipped negative, others remain positive. ECRI US leading indicators came in at 0.1. Draw it all together and the picture is one of weakening but mixed leading indicators and current data disappointment. 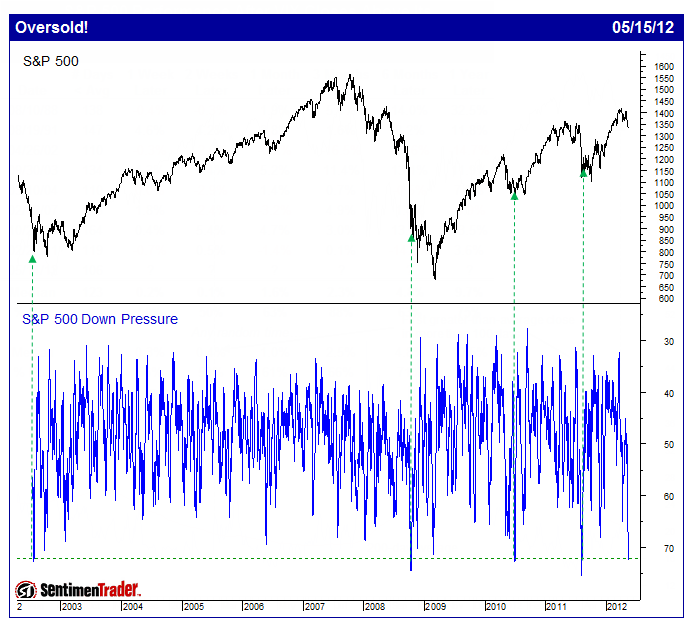 Add to this fear over Greece, with impending elections in June, and Euro CDSs still on the rise, and it is perhaps not surprising that we sold off and moved down to oversold and overbearish in pro-risk in a variety of indicators. However, now that we have hit those levels, a snapback rally should occur. 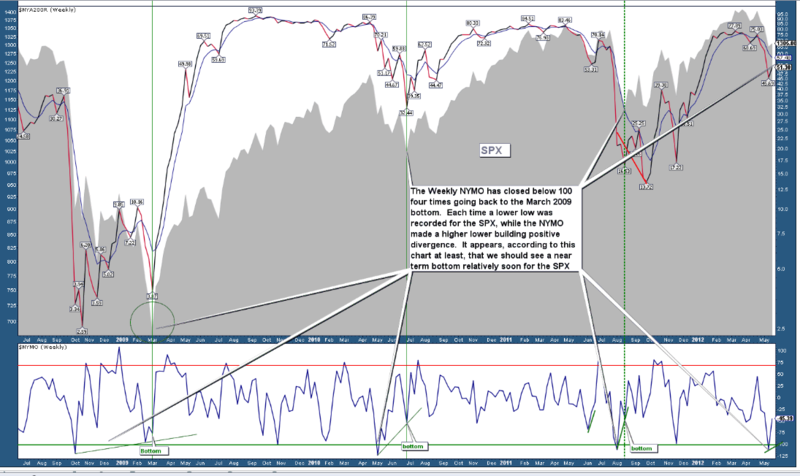 Regardless of outlook, a period of mean reversion should come to pass. The US dollar is trying to break out on those extreme contrary readings, which suggests it could reverse here and make that little break to the upside a fake out. If it is to do so though, it needs to occur right away, which would support the rally-from-here option. Clearly, newsflow has the power to trigger here. Since capitulation a week ago, stocks rallied without any real positive developments on the macro front. For this reason I suggest the rally was thus far fairly weak. 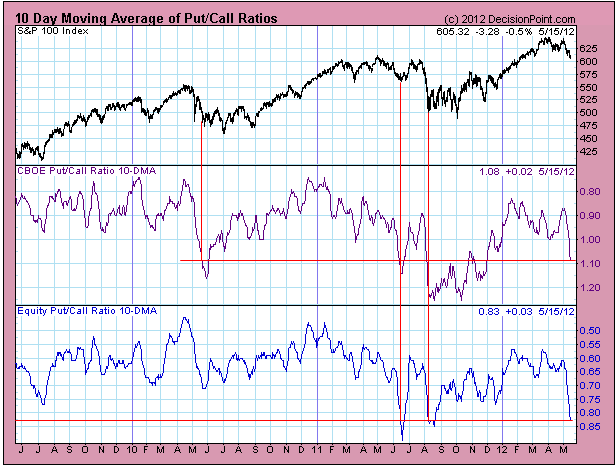 But should some positive news come to light, then the mean reversion should accelerate. Several technical indicators that I have previously referred to (such as nominal Nymo, insider buying) point to this being an important bottom, suggesting we can rally into mid-year. By solar cycles, we should see a natural turn up in growth and inflation and speculation. I expect that to occur, but boosted by central banks intervention in this soft period. The secular position that I wrote about supports upside too. So, I remain a bull, with longs. But the acid test will come as we make the mean-reversion rally ahead. If this is supported by central bank actions and improving leading indicators and economic surprises, then I expect to be proven correct. 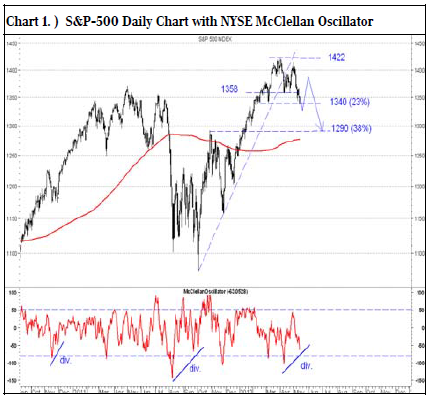 If however the picture remains weak and negative divergences abound, then I would alter stance and sell into the rally. 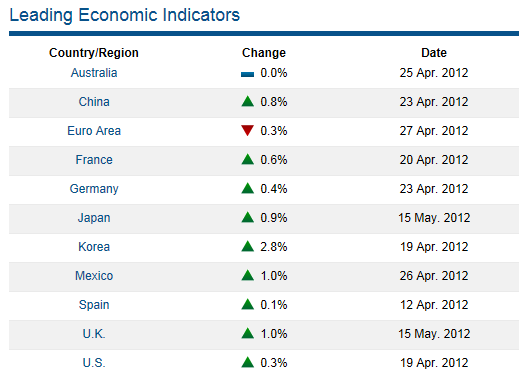 Leading indicators released this week for France, Australia, Germany and China all came in positive. China manufacturing data underwhelmed. Global economic surprises data has been neutral the last 2 weeks – the downtrend has been arrested but no uptrend has emerged. The Euro continues to decline, but under extremes of overbearishness and oversold readings (elastic stretching). Commodities have been accordingly pressured, but with the exception of oil most remain above last week’s lows, and the same applies for most stock indices. So the question is whether pro-risk will follow oil and the Euro to new lows. The Nymo positive divergence that I last mentioned 16th May was removed by the subsequent two days deeper selling. That leaves us without the typical divergence that we see at a bottom. However, the extreme reading the Nymo reached suggests an important bottom will be forthcoming in the next few weeks, if this isn’t it. Capitulative Breadth (Rob Hanna’s CBI) hit on Thursday and Friday of last week. In the chart below for 2011 the lower blue line shows where this happened last year. The first occasion was in March, which produced a kind of V-bounce in stocks. The second was in June, where a more rounded bottom was reqired with some volatility around the basing, and the third was the Sept-Oct much longer, messier bottoming. That Sept-Oct period was a double bottoming, however, and buying the first CBI did lead to a v-bounce, only shorter lived. Percentage of stocks above the 50MA shows how extreme oversold we just reached, but again from that kind of level we have previously seen v-bounces or more extended basing, lasting from a couple of weeks to a couple of months. But there is an overarching message: from such extreme readings in Nymo, % stocks above 50MA and CBI (which hit 11 on Friday), the nominal bottom was close, and buy-side attack was the appropriate strategy. My models show downward pressure into the end of next week. What happens the last couple of days of this week I therefore consider to be key. If stocks can rally further away from their lows then I would expect Euro and oil to reverse and join them and for a v-bounce low to be happening, with some consolidation only into the end of next week. If pro-risk alternatively falls and takes out last week’s lows then I will be looking to attack on the buy side again once we see the Nymo divergence and that would most likely after the end of next week once positive pressure emerges. My leaning is for Friday’s bottom to hold, but we will see. We did not see the usual upside into the new moon of this last weekend. Instead we fell all the way into the close of Friday and then rallied on Monday, making for a cycle inversion. I still do not know why cycle inversions occur, and won’t be happy until I do. If full moons have hardwired negativity and fear into humans over evolution due to nocturnal hunting and sleep deprivation, then we can follow why suicides and depressions admissions are higher around full moons, and stock market returns lower. Why then, might this reverse just occasionally, and we rally right into a full moon, and the opposite into the new moon like the one of this last weekend? Solar trader Jan and I have discussed and maybe it could be as follows. Into this last weekend, bears were in control of the market, bulls had stepped aside. The positivity and optimism of the new moon did not inspire bulls to join due the increasing severity of the declines, but rather cemented bears in their conviction: i.e. the bears became more positive and optimistic about their positions. Just a hypothesis, but maybe it could be something along those lines. 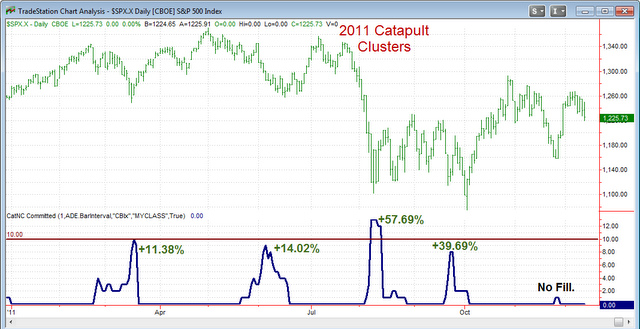 What’s interesting is that in 2011, my 3 lunar cycle inversions appeared to be significant – see chart below. The first marked an end to the uptrend out of 2010. The second marked the end of the sideways consolidation and start of the sharp correction, and the third marked the end of the of the sharp correction. Again, this is just a hypothesis that maybe they are significant. 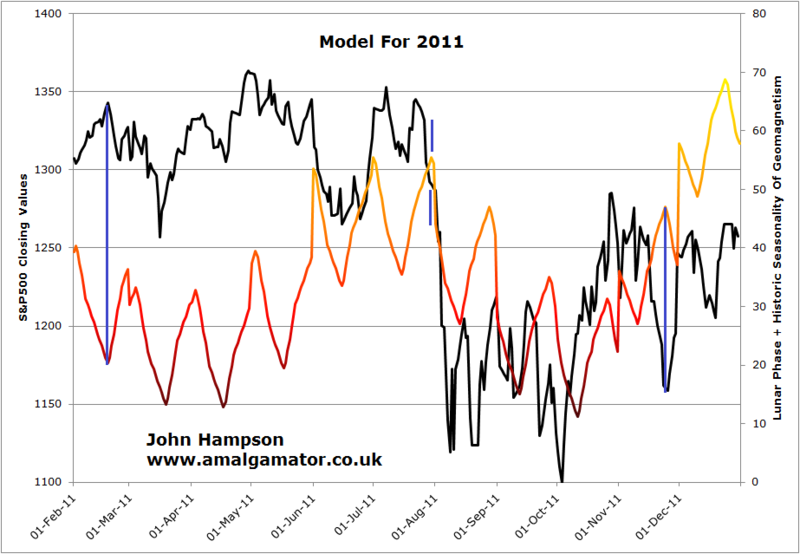 But the rest of 2011, the market fairly well tracked the lunar phase oscillation as we would expect. In 2012 we already saw one occur in February, which perhaps marked the end of the up-move out of 2011, as oil and gold topped in February and indices as a whole started to track overall sideways. Then this last weekend’s inversion could spell the end of the sideways consolidation or the end of the correction. The seasonality of geomagnetism would support the market beginning to rally again here. As would the secular position, posted yesterday. 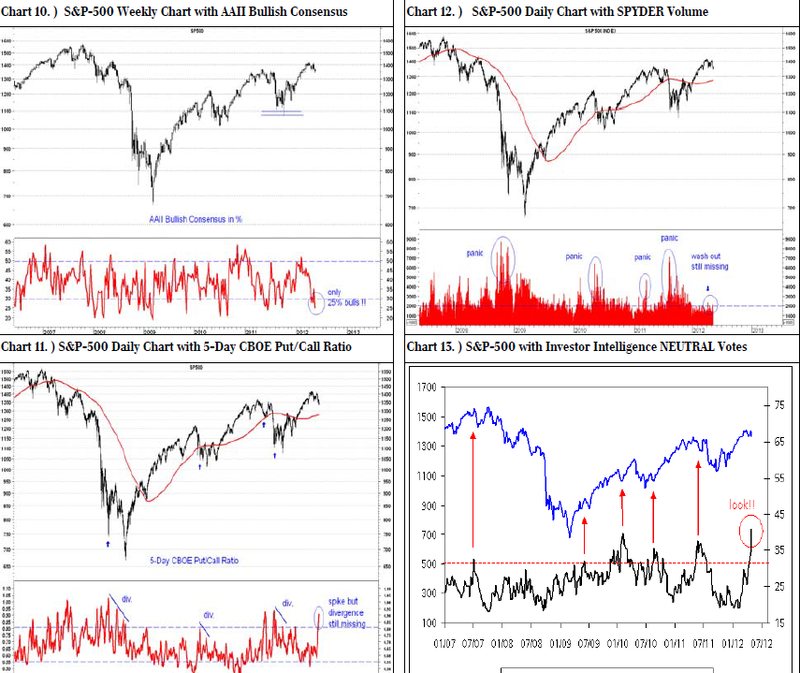 As would the major washout readings in sentiment, CBI and oversold indicators. If you are of a different persuasion, it could mark the end of overall sideways correction and the beginning of massive falls. Just a hypothesis, guys, on cycle inversions. I post it for interest, and we’ll look back later in the year on whether it was a major turning point. I have updated the short and medium term model pages. I am not around much today and tomorrow. What if I said the prices stock indices are at currently may never be seen again? I’ve not gone crazily bullish, but it is possible. Let me explain. This is a compilation of global stock indices, provided by commenter John. They are all in large triangle formations. Symmetrical triangles following sideways action since 2000 is very much in keeping with previous secular stocks bears under permanent policies of inflation, namely sideways coiling. So which way are they going to break? A symmetrical triangle forming following a sideways range gives no edge technically – it can go either way. But note that the S&P500 has broken out upwards and is backtesting the triangle, whilst the Nasdaq, not shown, is even more bullish than that. Below is the last secular stocks bear market. 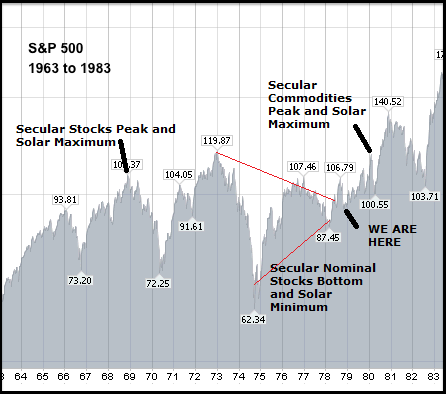 The secular/solar stocks peak of 1968 corresponds to the secular/solar stocks peak of 2000. 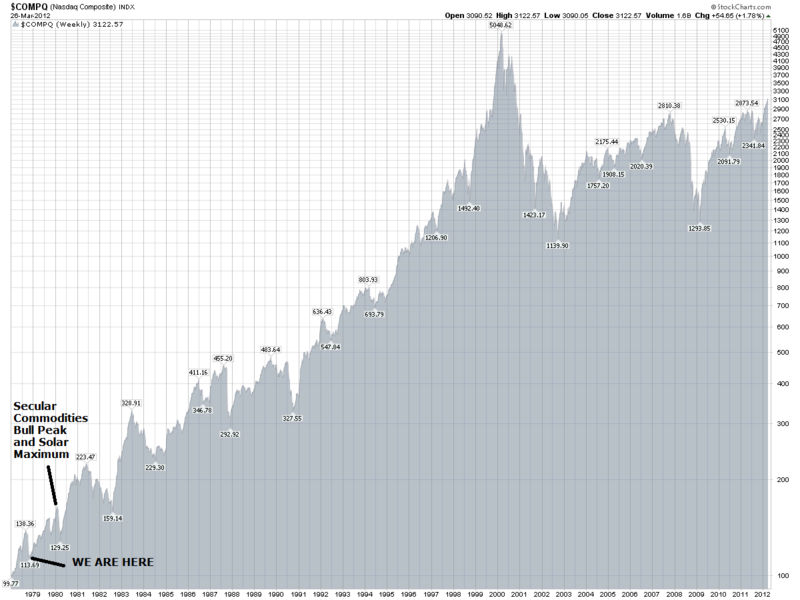 The secular nominal / solar bottom of 74/75 to 2008/9. A large triangle formed (in red) and broke out to the upside. One year away from the solar/secular commodities peak of 1980 (like now, 1 year away from the Spring 2013 solar peak), stocks had also broken out and were backtesting the triangle – the We Are Here point. 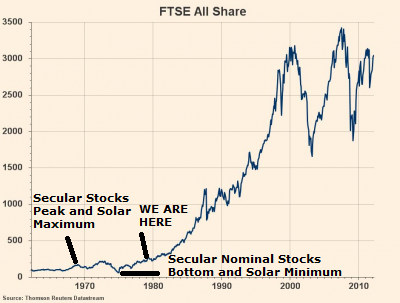 Now note that although stocks didn’t gain real new secular bull market traction until mid 1982 after the post-solar peak recession, they never got as low as that ‘We Are Here’ point again. Now take a look at the Nasdaq at the same point. Even more bullish, much like today’s Nasdaq. Cross over the pond, and the FTSE 100 did make slightly lower lows after the current equivalent point, but only marginally. A look at the FTSE All Share paints the same picture: barely new lows after this point. Looking at the secular bear market of the 1940s and the Dow Jones, stocks did not take off in earnest until 2 years after the equivalent current point, but again barely reached lower than the lows made 1 year before the solar peak. So, using secular bear market history as our guide and combining with the timing and influence of solar cycles, we have fairly bullish roadmap for equities from here forwards. 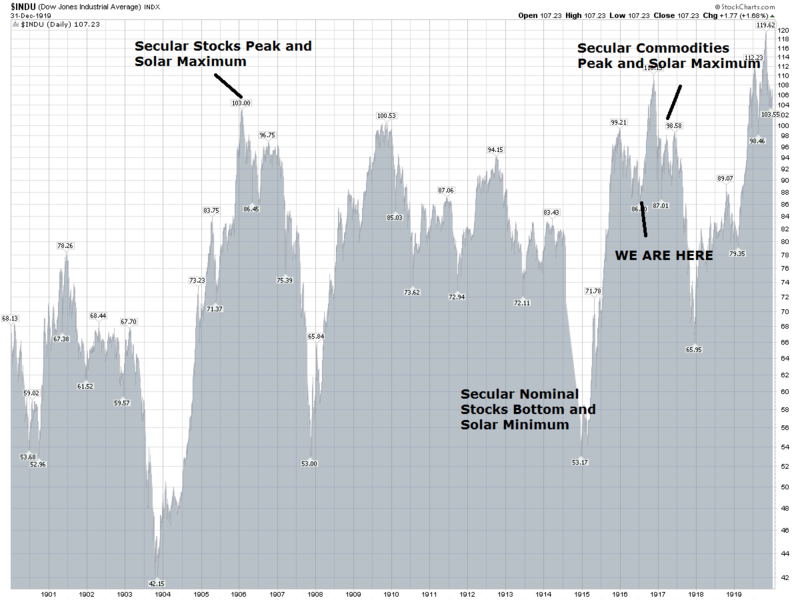 Into a solar peak we see a speculative maximum, making for secular tops. It therefore follows that stocks do not decline into a solar peak even when it is a secular commodities solar peak (and this is reflected in my historical analysis of stocks returns into solar maximums), as the pro-risk sentiment prevails. But what’s interesting is that the post-solar peak recession and bear market didn’t do much damage. It reflects what I previously said about redefining secular stocks bulls as beginning at the nominal lows of 1942, 1975 and, I argue, 2009. In past secular bears, the low point has come in the middle of what’s commonly understood to be the secular bear range, followed by a gradual process of repair. It therefore follows that the nominal lows for equities are successively higher after that point – e.g. between 1975 and 1980, between March 2009 and 2013. Right now, things look bleak. It seems that global growth struggles to sustain without central bank stimulus. Euro debt keeps returning to the fore despite government actions. Large companies are still going under as weak economies prevail. Yet, this is how secular stocks bulls begin – a huge wall of worry, which is dismantled piece by piece. They don’t start from everything being fixed, they start from a mess, but a mess where equities are historically cheap and a lot of excess has been purged from the system. All the last 3 secular bears have had more in common than differences: problematic inflation combined with sluggish growth, geopolitical disturbance, debt crises and the loss of companies and jobs. If it seems like problems are major this time round, it was no different back then. In 1979, the equivalent point to now, there were debt crises in Latin America and Korea and the USA had to raise its debt ceiling, much like today. In 1946, again the equivalent point, excessive war debts meant that interest rates had to be kept low, despite inflation, much like today. 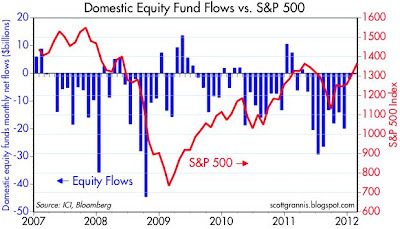 Fund flows in equities have been negative the last 5 years and continue to be outflows. Retail participation in stocks still isn’t happening. Yet participation in treasuries continues to increase despite real treasury returns being negative. In other words, the fear of stock declines is so great that people would rather be parked in something paying a guaranteed small real net loss. 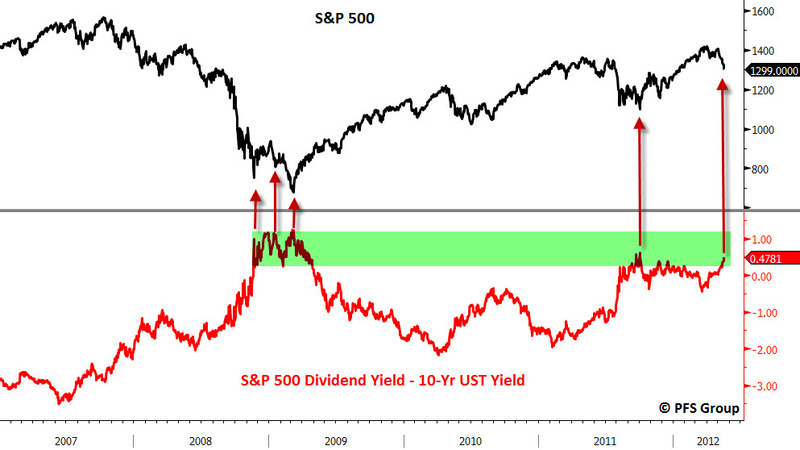 Stock dividends are highly attractive compared to treasury yields, back at levels compared to 2009. 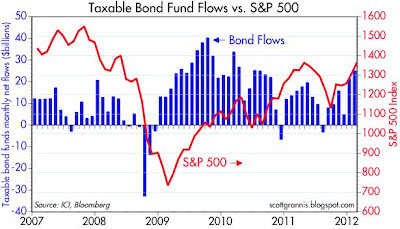 As it slowly dawns that stocks are going up, not down, money still start to flow the other way. Once that occurs the secular stocks bull will truly gain traction. Secular bear markets in stocks typically end with p/es in single digits. Current country p/e ratios that have reached single digits right now include China 7.2; Hong Kong 9.2; Norway 9.6; Russia 5.2; Singapore 8.9 and UK 9.7. Others aren’t there yet, such as US 14, Brazil 10, Germany 11, Australia 13 and Japan 14, but after the next bear and recession, circa 2014 by solar cycles, I expect them all to be there. Consider that US stocks topped around p/e 40 in 2000 – again, that’s quite a process of repair. Once the natural cleansing cycle is close to completion, genuine global growth will get going again, without central bank support. Technological evolution will be the engine. 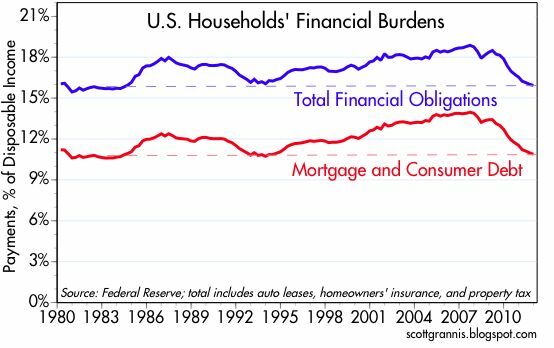 Excess debt may have been transferred to government balance sheets, but the major economy debt to GDP levels aren’t at crisis points. Once revenues pick up and central bank support diminishes, the rate of balance sheet expansion will slow. Euro debt and the Greece situation needs further counter action currently, but governments have made it clear, both in words and actions, that they will step in to prevent worst case scenarios. In short, I acknowledge the seriousness of the issues we face right now, but also the intent of global leadership. Most importantly though, history reveals that it is normal at this point in the secular bear to still be facing such challenges and that despite the challenges (or even thanks to them: wall of worry) we should be looking up, not down for equities. I’m not implying that all-in on equities right now is the way to go. Commodities should make their final blow-off move into next year, making them more attractive than stocks over the next 12 months, and thereafter a bear and recession should eventually provide the final great opportunity to get into equities. But there is a chance, even a likelihood, that the low in equities at that point will be higher nominally than now, which makes me reflect on all the long positions I took last week in equities. 2013 is the forecasted solar peak, inflation peak and secular commodities peak by solar cycles. 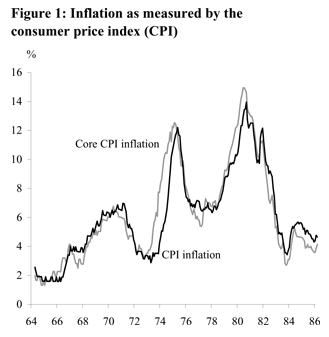 We saw the first inflation peak in 2008 – which would be 5 years prior, just like in the 1940s and 1970s. The chart below shows the 2008 peak and our trending upwards since then again, despite the ‘deflation’ chatter. 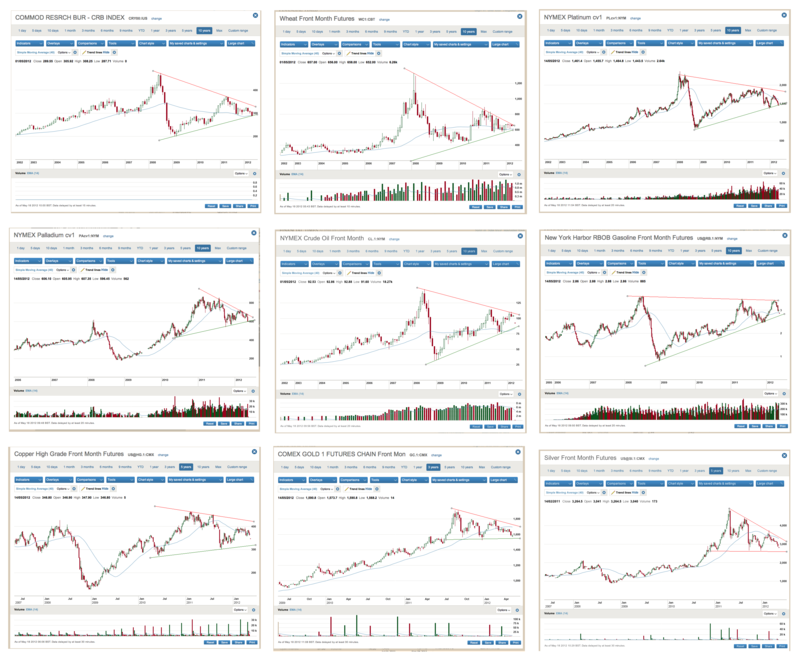 Now look at the commodities charts, courtesy of John again. Large symmetrical triangles, like stock indices, but the difference is that these formed in upward rising trends in place since 1998/2000. By the book, that makes them more likely to be continuation patterns. I believe they will break out upwards, and when they do, they should make the acceleration into the secular /solar peak, fulfilling the inflation prediction at the same time. 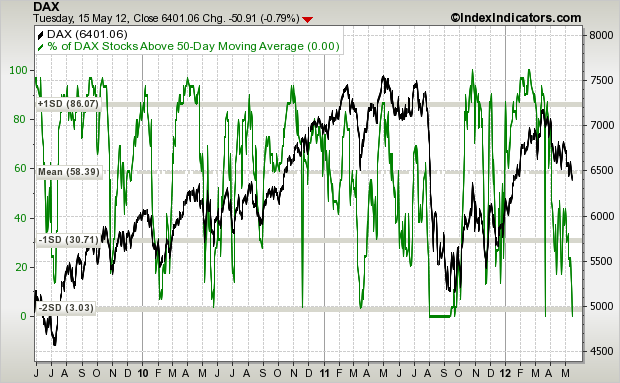 At yesterday’s close, Capitulative Breadth hit 7, so into the 7-10 zone that historically brought about a bottom. Nymo is into the extreme oversold zone, at -100, and we saw a large daily volume candle yesterday, both signalling a bottom. If we don’t bounce today then I suspect we will crash, make a cycle inversion into this weekend’s new moon, and then rally on Monday, but my expectation is rather that we print a daily hammer candle today, from this out-of-hours (for Europe and US) selling, due to the indicators above, and shared yesterday and the day before. I have added to Hang Seng longs this morning, and will buy more pro-risk if we fall further today or even crash. I maintain these are golden opportunities for a significant bounce as we print one oversold or overbearish extreme after another. 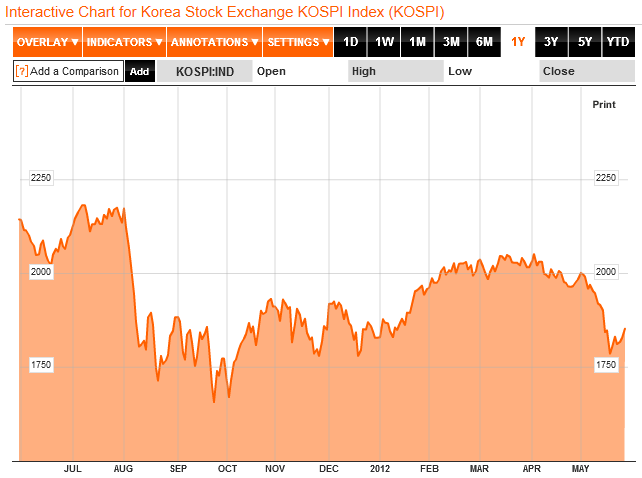 On the macro front yesterday, US leading indicators came in at -0.1, but Korea a woeful -1.5. If LIs turn down en masse then the picture changes, so let’s see. US economic data also disappointed yesterday and with Euro CDSs continuing to rise, global government and central bank intervention draws closer, both out of necessity and likelihood. 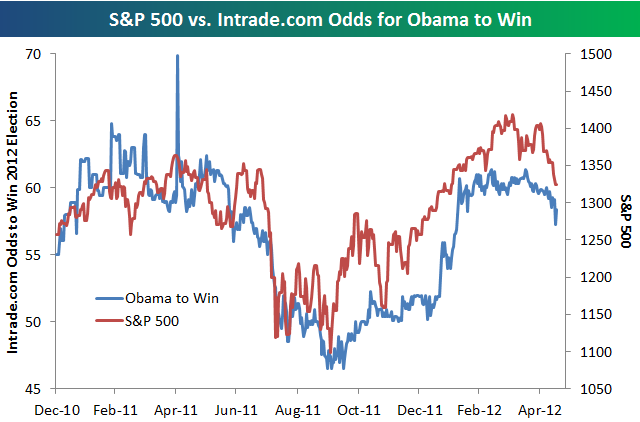 It is a contrarian’s dream, right here right now. These are the opportunities that make me lick my lips: oversold and overbearish extremes. This morning I have added long Hang Seng, FTSE 100, silver, oil. AAII sentiment at bearish extreme, plus high percentage of II sentiment neutrals which has historically siginified a trend change. UBS here highlight the lack of high volume capitulation. Yesterday gave us a voluminous daily candle, but capitulative breadth only reached 3. It is possible today we could see that capitulation, followed by a hammer v-bounce. Let’s see. Nymo positive divergence. 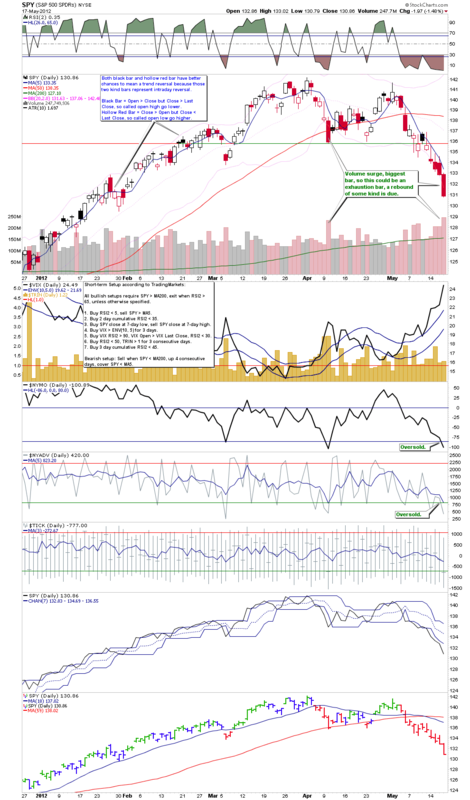 Again, UBS’s chart, with their interpretation that we will see a significant bounce then further downside. I repeat my point that whether you side with my longer term projections or not, a period of mean reversion will follow when pro-risk hits oversold and overbearish extremes. 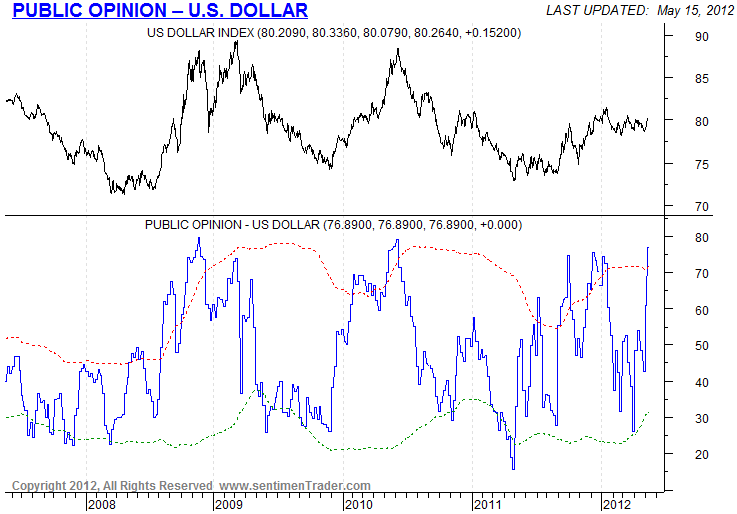 Sentiment is at bullish extreme for the US dollar. 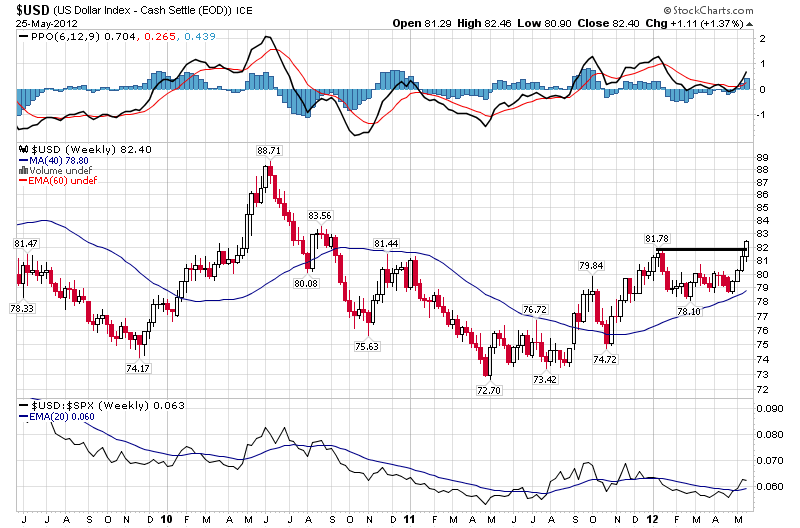 Euro-dollar RSI is in the extreme oversold zone. The USD longer term is now at horizontal resistance. 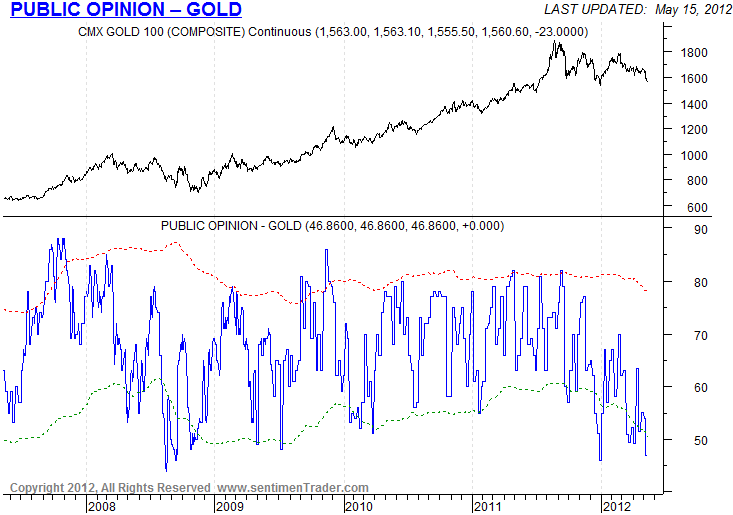 Gold sentiment is extreme bearish. 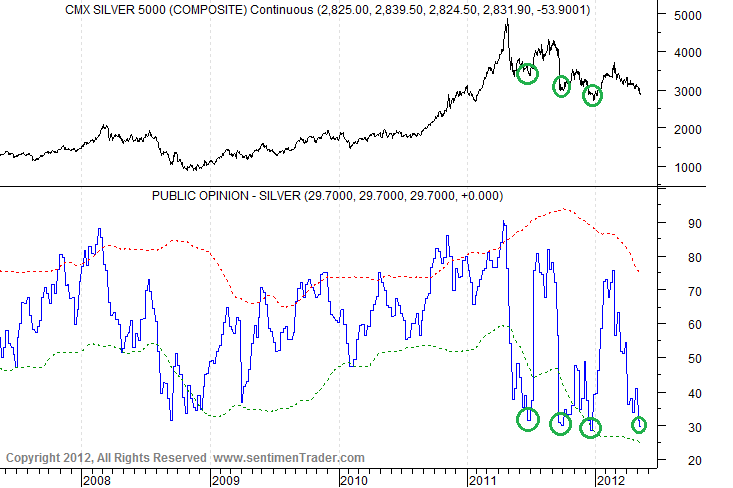 Silver sentiment also, levels that histrorically marked bottoms. 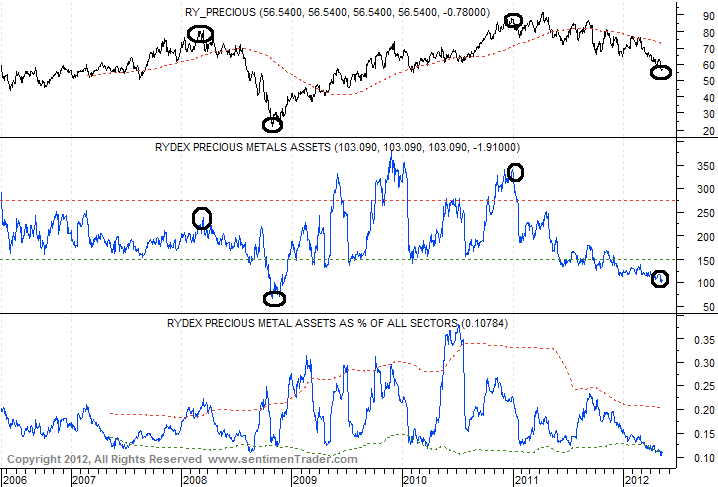 Rydex precious metal allocations are at extreme lows. 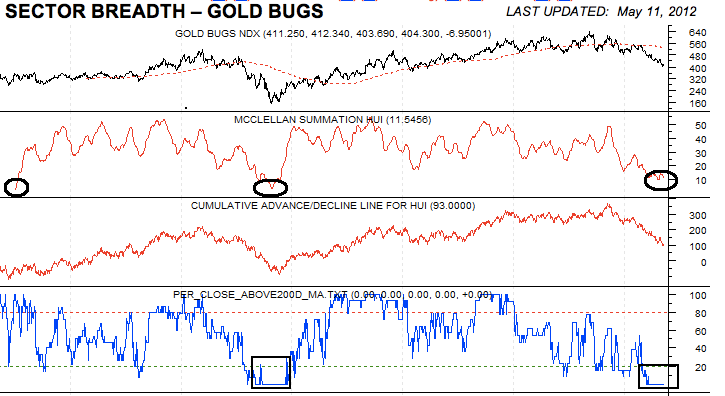 Gold miners are at oversold and overbearish extremes. 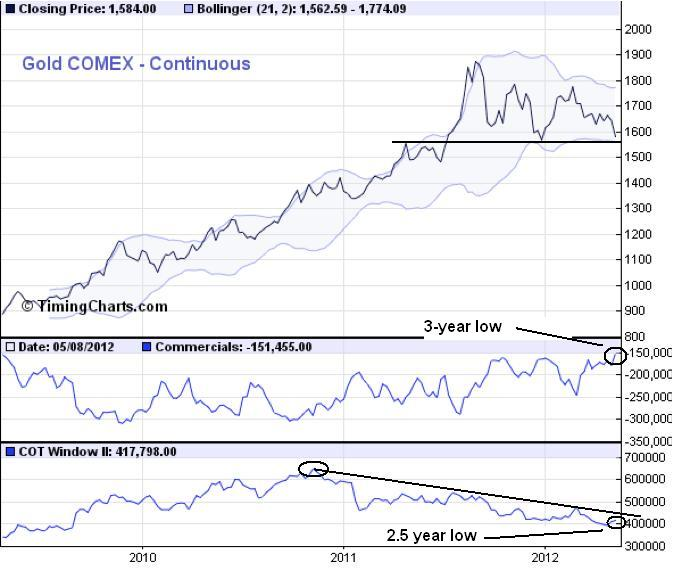 Gold commercial and open interest is at contrarian extreme. Commodities are at long term historic low valuations compared to treasury bonds. Treasury bonds are at all time highs, paying negative real returns. Various agri commodities are in the overbearish extreme sentiment zones, including orange juice, coffee, wheat and cocoa. The global temperature figures for April came in at the second warmest on land since records began. Dry weather gave agri commodities a push up yesterday, counter to the pro-risk sellling, as harvests are likely to be affected. Lastly, the macro front. Leading indicators point to growth ahead, with the exception of Euroland. 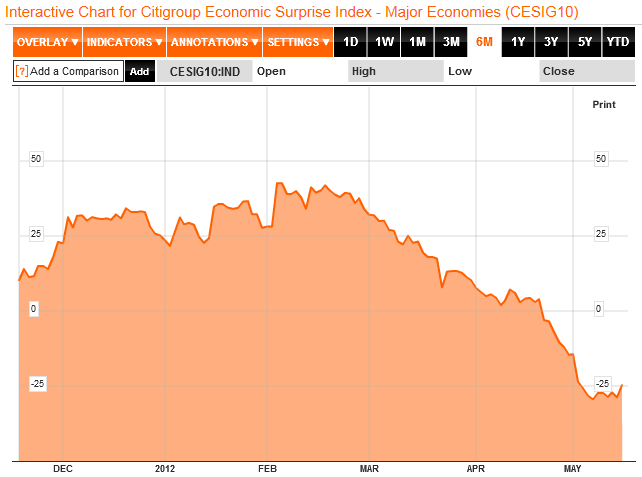 Economic Surprises have stablised in the last couple of weeks for the major economies. 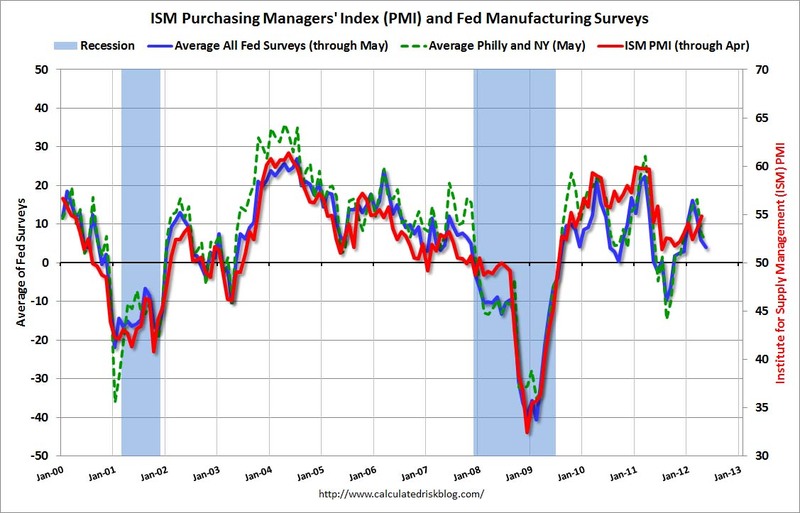 Leading indicators suggest we may see them turn up ahead. But the overarching issue currently is Greece and Euro debt. Spanish CDSs are at a record and still climbing, plus Greece is going back to the polls with a probability of installing a government that does not agree to the bailout terms from the ECB. The fear is that Greece is expelled, makes a hard default and brings down major European banks. I am not belittling the Greece and Euro debt issues. But we have been here before, the last 2 years. Politicians will take action, central banks will take action. 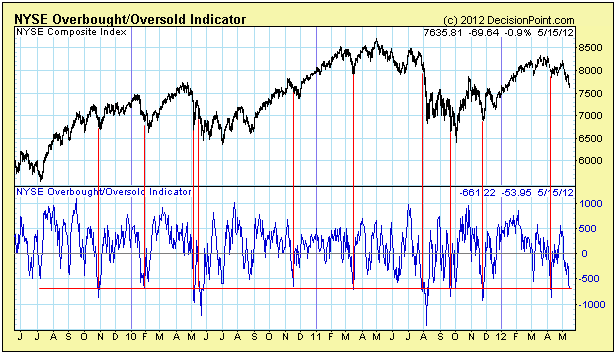 The oversold/overbearish extremes scream opportunity, to me. If the Greece/Euroland saga rapidly spirals into the worst case scenario, and pro-risk plunges much further before reviving, then I will take some account pain. But I always keep powder dry. If we do plunge much more overbearish and oversold I will attack again lower down. But I believe the bottom is close at hand.